Inverness CT's Liam Polworth scores to double the lead for his side. John Robertson’s plea for someone to step up and take chances was answered in emphatic style as Caley Thistle ran out 3-0 winners against Dunfermline. Shaun Rooney, Liam Polworth and George Oakley all found the net in the second half to take Caley Jags to second in the table – behind neighbours Ross County – and extend their unbeaten league run to 16 games. Inverness made two changes from the 2-2 draw with Alloa Athletic a week ago, with Aaron Doran and Jordan White coming in for Nathan Austin and Oakley. Robertson’s side tasted defeat on both of their trips to East End Park last season, the first being a 5-1 humiliation in August 2017 and then a 1-0 midweek defeat that remained their last league defeat, heading into this game. The Pars, however, did beat Inverness in an IRN-BRU Cup tie last month. Inverness had men up in support of lone striker White, with Doran, Tom Walsh and Polworth playing in behind him. The temptation with having a forward of White’s size is to aim hopeful high balls towards him and try play off knockdowns, something which they tried to do at Hearts in July, without success. When they looked at their best at Tynecastle they played with the same fluid three behind White as they did on Saturday and they looked to have learned from their mistakes. Build-up play went into White’s feet and the midfield looked to use him as a backboard to play off, which allowed runners to fill gaps around him. Dunfermline’s threat was coming from long range and after Miles Hippolyte rattled the crossbar 17 minutes in, both Danny Devine and Lee Williamson whistled efforts past Mark Ridgers’s far post. A regular gripe for Robertson has been his side’s inability to take chances and seeing Joe Chalmers head over from the six-yard box, when Walsh had picked him out, will have had him fearing more of the same. Joe Thomson wasted a chance to test Ridgers before the break as he headed over from a similar position to Chalmers, while the game had its first real instance of needle when Carl Tremarco’s challenge on Louis Longridge sparked a melee between the players, with Polworth and Hippolyte also involved. On the list of potential goalscorers for Caley Thistle, Rooney would have been far down the list but the right-back emerged amid a crowded penalty area to head in Walsh’s centre. The home fans were now growing restless, with their ire directed at manager Allan Johnston. His response was to raise new signing Robbie Muirhead, brought in from MK Dons before the transfer deadline, from the bench in place of the mercurial Hippolyte. But it mattered little as with 18 minutes to go, the gloss was put on a fine afternoon for Caley Jags through Polworth, as he arrived at the back post to meet Doran’s cross and complete a wonderful counter-attack. Even with two Scottish Cup winners in their ranks, in the guises of Danny Devine and James Vincent, the Pars did not have the beating of Inverness. A late Ridgers save with his feet kept out Faissal El Bakhtaoui. The understanding that is developing between the three attacking midfielders has to be something that is nurtured over the coming months, by playing the trio together regularly. Polworth in particular revels in the conducting role at the centre of the three. Doran, too, looked close to his creative best and his confidence was personified in his assist for Oakley’s goal, flicking on a miscued clearance by Ridgers to the substitute, who rolled the ball in at the far post with ease. Dunfermline (5-3-2) – Robinson 6; Williamson 5 (Higginbotham 67), Devine 6, Ashcroft 5, Durnan 6, J Longridge 5, Thomson 6, Vincent 6 (Connolly 79), L Longridge 6, Hippolyte 6 (Muirhead 59), El Bakhtaoui 5. Subs not used – Gill, Craigen, Martin, Ryan. 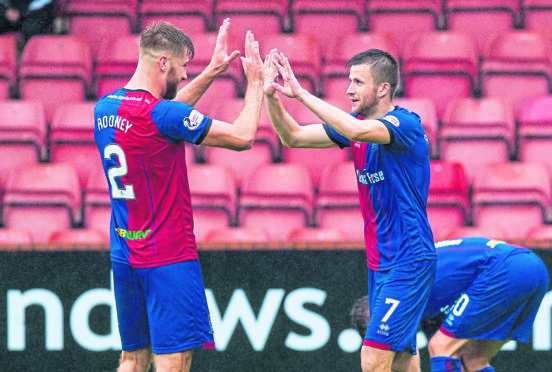 Caley Thistle (4-2-3-1) – Ridgers 7; Rooney 7, Donaldson 7, McKay 7, Tremarco 7, Welsh 7, Chalmers 6, Doran 7 (Calder 84), Polworth 7 (Trafford 84), Walsh 7 , White 6 (Oakley 67). Subs not used – Hoban, McCart, MacKay, Brown. Referee – D Robertson 6. Man of the match: Liam Polworth.